Monterey Jack is the team's muscle, not only able to do things the other rodent members of the team couldn't do, but also sometimes things full-grown humans wouldn't be able to do. How does that work, just from a leverage point of view? He's a mouse. Even the largest mouse is still simply a mouse. Well, he's an Australian mouse, so that probably means he has a stinger on his tail and enflamed venom sacs, but still. [Ha ha ha! Everything is deadly in Australia! --ed.] Monty wears as much clothing as Chip and Dale combined, with a teal turtleneck sweater, a tan overcoat, and a leather cap with goggles. Because nothing says "adventurer from the burning desert of the Outback" like a sweater and overcoat. His mustache is supposed to be red, but here it's nearly the same brown as the rest of his fur. This Mystery Mini is two in one, because Monterey Jack comes with his little sidekick, Zipper. Zipper is a bluish-green housefly with large yellow eyes and a red sweater, and since he's so small even by Rescue Ranger standards, it wouldn't make sense to release him by himself. He's smiling widely, and is sitting perched on Jack's raised right arm. Since the arm is just glued in at the shoulder (and the nose is just glued into the face), it would have been neat if Funko had made a chase variant with Monty in the midst of a "cheese attack," with swirling eyes and a twisted mustache, and him holding a chunk of cheese in his right hand instead of carrying Zipper. 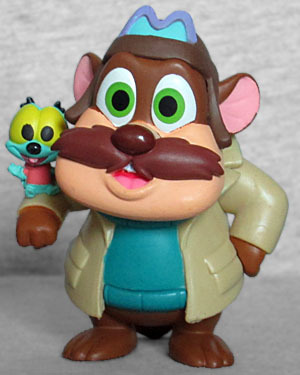 Of course, Monterey Jack is already a 1:72 figure, so a chase would have been even worse.